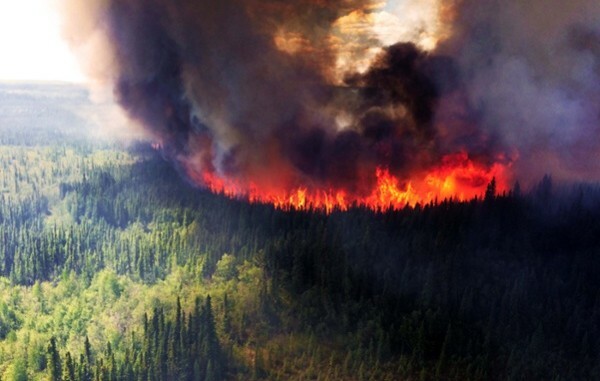 Wildfires have dominated headlines for much of the past few months. So far this season there have been 1,638 wildfires with 101 burning on the same day, making May 18 the third busiest day since 1990. These numbers are also well above the five year average of 1,223 wildfires. It’s also worth noting that 737 of the aforementioned wildfires were caused by lightning strikes, meaning the other 901 were caused by humans, making them 100% preventable! 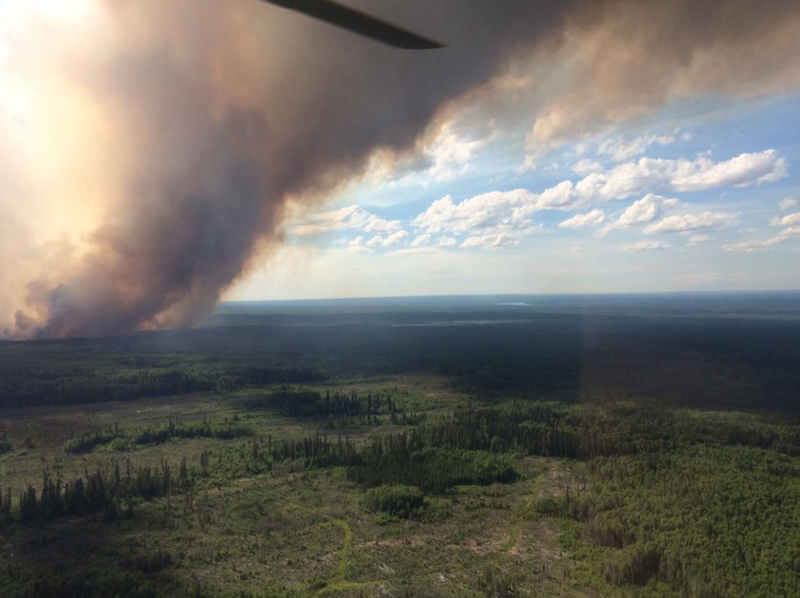 It goes without saying that Alberta’s Wildland Firefighters have been kept busy during the early part of this fire season, which typically runs April 1 through October 31, but after the devastating fires near Slave Lake in 2011 that start date has been bumped up to March 1. 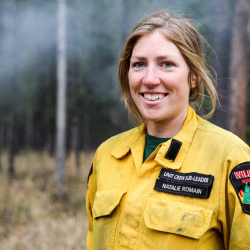 Despite her hectic schedule, Natalie took some time to chat with me about her career as a Wildland Firefighter thus far. This is my fourth season. 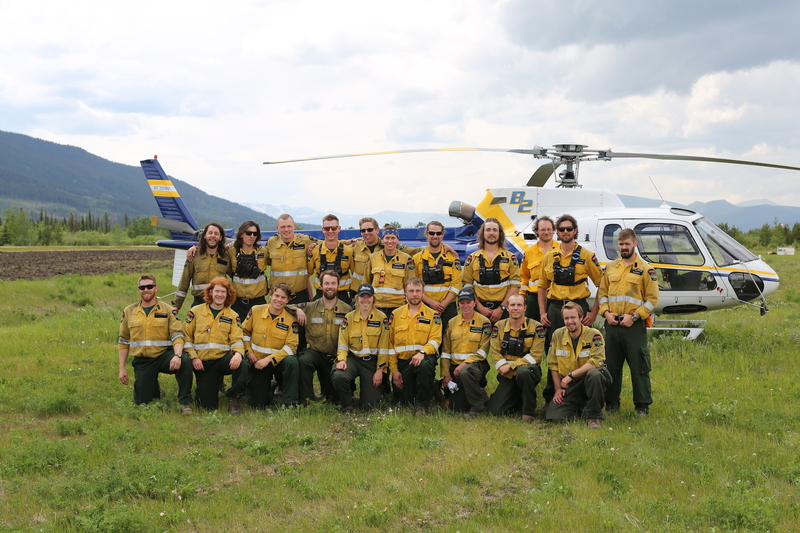 I spent two years as a Helitack Member and one year as a Helitack Leader in the Fort McMurray Wildfire Management Area. This fourth season I am now a Unit Crew Sub-Leader in the Edson Wildfire Management Area. I originally started out as a Wildfire Dispatcher and was intrigued by the thought of actually fighting wildfires on the ground thanks to Jen, the Helitack Coordinator at the time in Fort McMurray. I was really intrigued, but reserved because I knew it wasn’t easy. I knew you had to be strong and able to handle emergencies. Jen did Helitack and was a Helitack Leader for the area. She was so positive and encouraged me to go for it! Growing up I’d always wanted to pursue firefighting; I’ve always liked working hard, doing physical work, and helping people. I continued down the environmental studies route for post-secondary as I love always being outside and being immersed in nature. 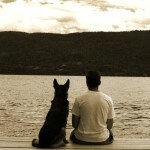 I found this job and instantly fell in love. I get to fight wildfires, be active, and still work outdoors and enjoy nature while working with people and making a difference. I was also right when I thought it was going to be hard and tough, but so worth it and so rewarding. 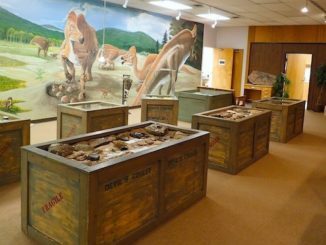 Once you have passed the WFX-Fitness Test, you then go to the Hinton Training Centre for intensive training, which includes 6 a.m. fitness every morning. The program teaches everything from fire behaviour, to the types of equipment we use on the fire, to chainsaw training. There is a lot to learn, but it’s a great two weeks. The instructors are incredibly knowledgeable and it’s an overall great program to prepare you for your first wildfire season. Fitness is key for this job. You want to have a fit crew because everything on the job depends on your ability to persevere. There is a six-week fitness program you can find online, which I used my first year to help me with the fitness test and it helped immensely! I never was much of a weightlifting person until this job. I love to run, which helps out a lot because cardio and stamina are everything. In the winters I keep busy with ice hockey, running, cross country skiing, and during the fire season we try to workout as a crew for at least an hour each day, which can include 10 km runs, interval training, and/or weight room training. This season we are spending so much time on the fireline our dedicated fitness time has been put on standby, however our day on the fireline is a workout in itself. From shuffling at least 70 lbs. of gear up steep hills to running pumps and hose across distances up to 25 km takes a high level of stamina. After each day on the fireline we are that much stronger and that much more experienced. The amount I eat alone is impressive! My lunch bag holds almost 10 lbs. of food just to sustain me throughout the 12 hour work-day. 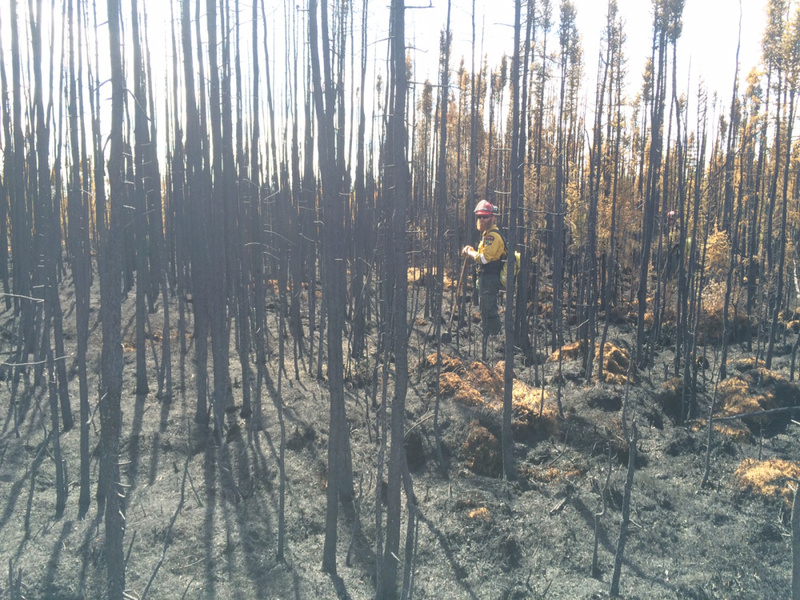 We have ten Wildfire Management Areas in Alberta. 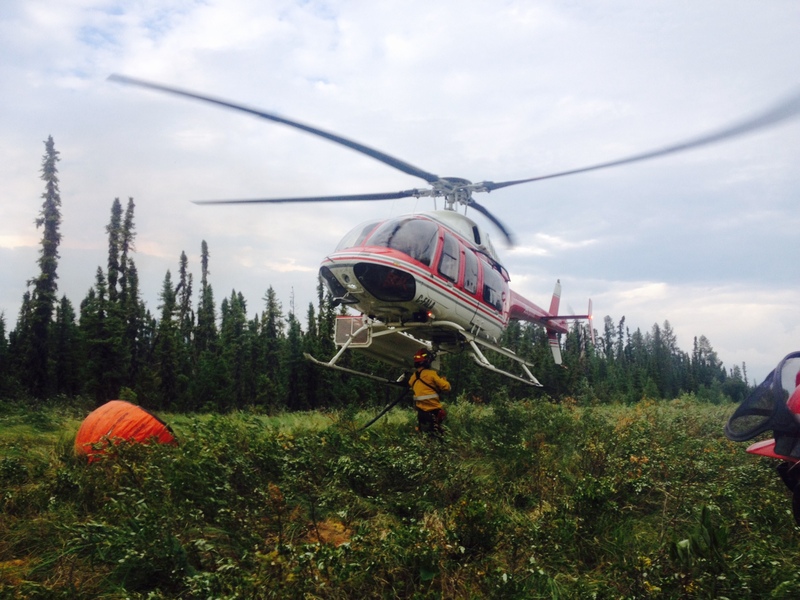 Across the province there are 64 four-person Helitack Crews, 2 eight-person Helitack Crews, 9 seven-person Rappel Crews, 8 twenty-person Unit Crews, and 35 eight-person Firetack Crews. All the crews are very mobile and can be moved where needed most. Note: For additional information about the wildfire crews and their specific roles please visit this blog post. Each crew plays a different role. I am on a Unit Crew which normally fight larger wildfires, so our equipment may be different compared to initial attack Helitack Crews. Our trucks are fitted with one mark 3 pump, a pump kit (nozzles, stranglers, fuel line, and random jewelry like quick connects and wyes), suction hose, two 50-gallon Jerry cans and five boxes of 1 ½” hose, which is a total of 2,000 feet. With a good water source, like a river or a creek, we can get to work and get a lot accomplished. Each sub-crew of four carries the exact same equipment layout so multiply this by five just for one unit crew! We also carry chainsaws and hand tools (shovels and pulaskis). Day one of shift we head out to any out-of-control wildfire that is a high priority. Wildfires near communities or other values that could be a risk take priority. We always have our bags packed and ready for 18-21 days just in case. A normal shift is 15 days on, six days off. Day one we usually travel to the Alberta Agriculture and Forestry base or the fireline camp, get briefed on the fire behaviour and go over strategies, set up our tents, and get ready for the next day. Day two usually starts with a 7:30 a.m. safety briefing, so we get up by 6 a.m. for breakfast and make a bag lunch for the day. After the safety briefing there is an operations meeting that outlines where other crews are working and how progress is doing. 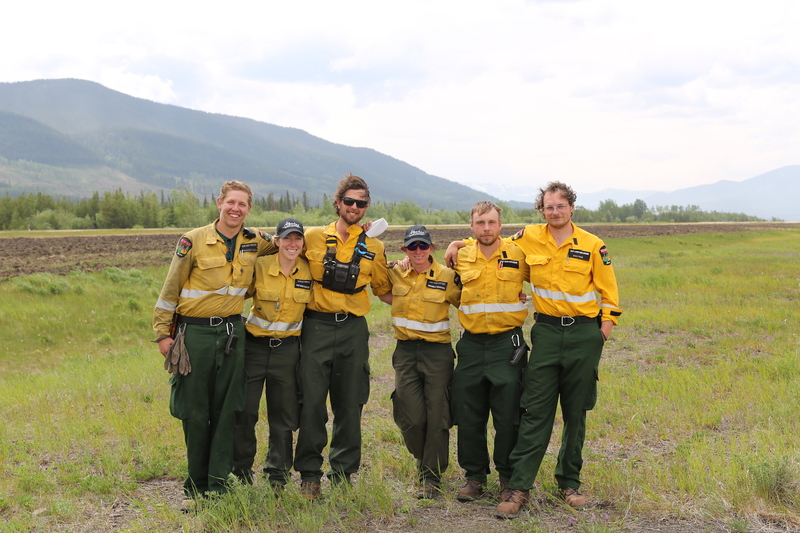 We then fly out or drive to our section of the wildfire and, depending on location, our leader Michelle plans where she wants each sub crew working our section. We have our mission and put boots to the ground. On our last deployment we were dropped off by helicopter and then our gear was slung in afterward. We then hiked the rest of the gear to the wildfire. We try to find a good pump site and start laying hose along the perimeter to contain the fire. Our top priority is to contain the perimeter of each wildfire. The next day we will put out any fire or hotspots working in from the perimeter to about 100-200 feet. We will usually go through seven boxes of hose a day, which is 2,800 feet. Once we have our pump up and running the rest of the crew is on nozzle and running out more hose. In our 4-person sub crews we have one person in charge of the hose, what we call the nozzle person, who controls the speed and communicates with the rest of the crew. Person number two, the hose handler, strangles the hose for the nozzle person, holds the hose line, and helps move hose wherever the nozzle person wants to go. Person number three is laying out hose along the line and supporting the other two in pulling any slack in the hose. The fourth person, usually the sub-leader, is walking the line and will GPS any hot spots while observing how the wildfire is behaving. They will calculate how much hose is needed to complete the day and mark hotspots that need attention. We usually have lots going on while soaking the perimeter, for example areas can flare up further down the fireline that need to be fought right away or pumps can break or stall. We are constantly communicating with others sub crews and helping each other in case they have a hotter section that needs support. All of this makes the 12 hour days fly by! At the end of the day we catch a ride out by helicopter or drive back to the fireline camp around 7 p.m. We are usually back in time for dinner, a shower, and hopefully be in bed by 10 p.m. so we can do it all over again! On the second last day of our shift we will head back to our home area and have the last day to finish any outstanding paperwork and restock our gear. Rain is very helpful after long stretches of warm dry temperatures. Cold fronts and storms tend to bring in shifty winds and wind can constantly change the direction the wildfire is moving. Strong hot wind is a big factor. A lot of the time the gusty winds cause the wildfire to take a run. Pushing the wildfire in a certain direction can make suppressing the wildfire more difficult. Each daily safety briefing sets out what the wildfire size would be in a certain fuel type with the current winds, allowing us to work safely and anticipate what the wildfire may do throughout the day. It all depends on weather, when the snow melted, and how much rain the area receives. This year the snow melted pretty early and we didn’t get the rain we normally do in June. That made for extremely dry conditions across Alberta. I have not been anywhere but Alberta, but this is a great way to share firefighting experience and resources throughout the country and the world. This season we have many people from around the globe helping us fight wildfires and it is great. I’ve already worked on a wildfire with crews form Idaho and Ontario. It was a great opportunity to learn new strategies for fighting wildfire and to hear about their type of climate and the types of wildfires they encounter. Call 310-FIRE right away and be as descriptive as possible (ie: colour of smoke, exact location, etc.). 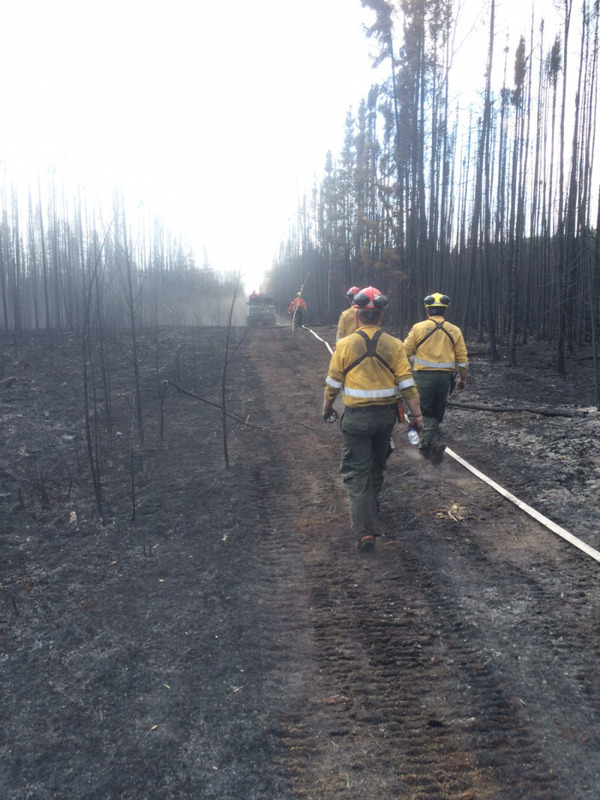 The more details provided, the faster our crews can find the wildfire and start to extinguish it. The sooner we can get there, the easier the wildfire is to get under control. I remember my second year in Fort McMurray we got a dispatch via a 310 call from a worker up north. This person called in a lightning strike then saw smoke right afterwards from an oil camp. With the great location details provided we were able to find this one tree that was on fire and we were able to keep it from spreading. This wildfire was only putting up very light smoke and it would have been difficult to spot on our usual patrols. 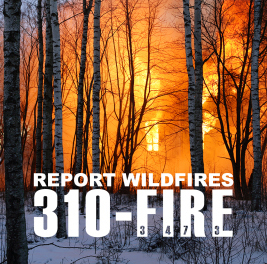 So thank you to everyone that utilizes 310-FIRE, you do make a difference! 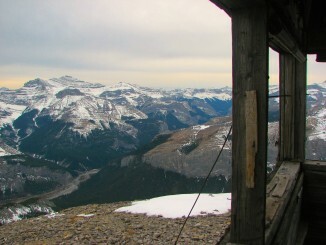 Another group of people I’d like to thank are the Wildfire Lookout Observers! They spot the smoke early and report it back to the office so we can put the fires out while they are small. 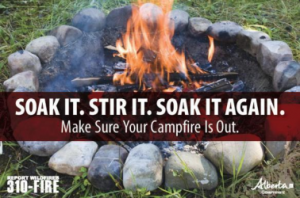 Be considerate of the size of your campfires and the flame height on some of those bonfires. Flames can easily reach into and torch surrounding trees. No matter if you are only leaving your campfire for a short hike, make sure to put it out. All the way out! This means soaking the ashes and stirring them until they are cool. Take the time to build a proper fire pit in your backyard. Digging your ring deep enough into the ground will prevent fire from burning silently underground and popping up somewhere else later. I would really like to thank Natalie for taking time out of her busy schedule to answer all of my questions and Janelle for making this interview a reality. 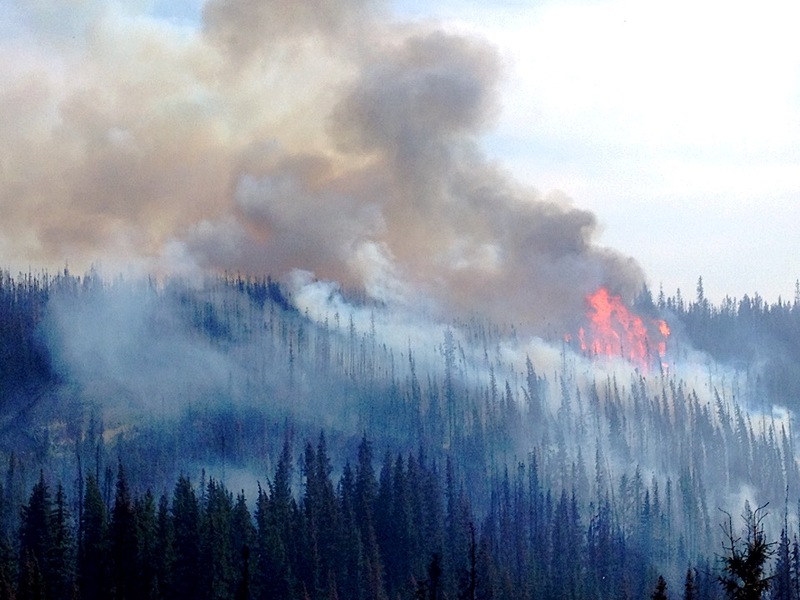 For additional information please visit the Alberta Wildfire website. 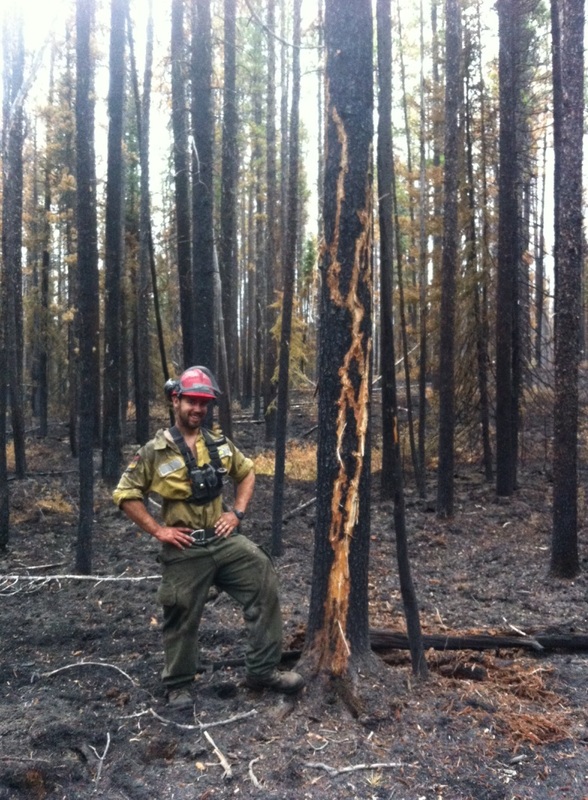 You can also follow blog posts from Wildland Firefighters Natalie, Jamie, and Troy. In addition please ‘Like’ them on Facebook and follow them on Twitter and Instagram. If you’re interested in applying to be a Wildland Firefighter all of the application information can be found here. To check the status of wildfires currently burning in Alberta please consult this Wildfire Status Map. Lastly, to check any current provincial fire bans please visit the Alberta Fire Bans website. You can also download the Alberta Wildfire smartphone app, which is now available on both iOS and Android. 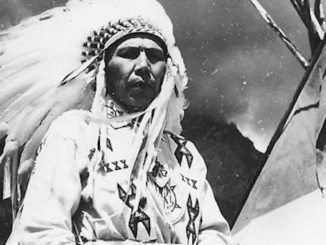 *All photographs that appear with this story were provided by Alberta Wildfire.